The Minnesota Lynx stood with their arms locked during the national anthem before Game 1 of the WNBA Finals. 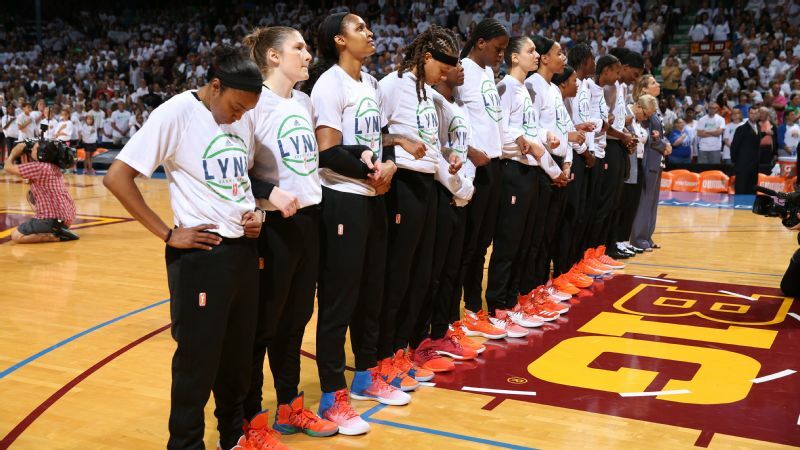 In the midst of the WNBA Finals, the Minnesota Lynx and Los Angeles Sparks have also been part of a wave of anthem demonstrations, which primarily swept through the NFL last weekend. 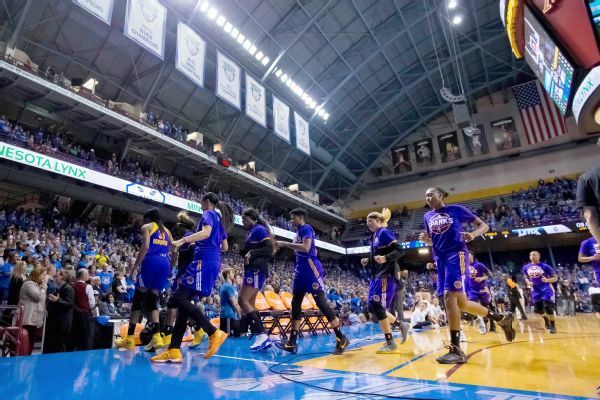 The Sparks stayed in their locker room during the playing of the national anthem before the first two games, while the Lynx first stood with their arms intertwined, then without. The two teams meet in Game 3 on Friday night. Earlier this week, a New York Post headline read, "WNBA players join NFL protest by skipping national anthem," and most attention was paid to the team-wide actions taken by the Pittsburgh Steelers and, later, the Dallas Cowboys. 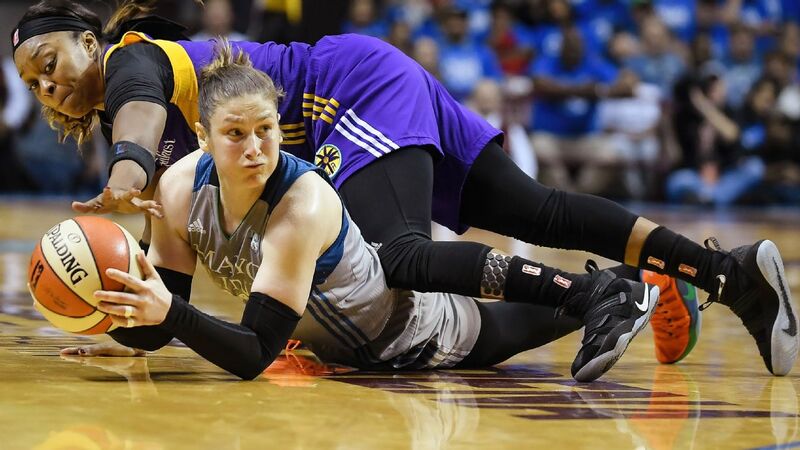 The WNBA has been notably absent from the ongoing national conversation around the events of last weekend. But these team-wide displays weren't a new phenomenon. Professional women's basketball players have been at the forefront of such demonstrations since last summer -- even before Colin Kaepernick took a knee. It's important to remember that this era of activism didn't begin with anthem demonstrations, but rather with NBA players showing solidarity with the Black Lives Matter movement. In 2014, a handful of Nets and Cavaliers players, including LeBron James, donned "I Can't Breathe" T-shirts before a game in recognition of Eric Garner, who died after a confrontation with New York City police that July -- though many of those players said it was an individual decision. NBA stars also opened the 2016 ESPY Awards with a powerful speech on police violence. Then in July of last year, the entire Lynx team showed up to pregame warm-ups wearing "Black Lives Matter" T-shirts. The WNBA initially fined teams and players for dress code violations, but later rescinded the penalties after significant backlash. Last September, the entire Indiana Fever knelt during the anthem before their playoff game against the Phoenix Mercury. SB Nation's Tom Ziller and Mike Prada put together a comprehensive timeline of the demonstrations WNBA players have made in the past year. Monique Currie, vice president of the Women's National Basketball Players Association and a member of the Phoenix Mercury, says many of these efforts were organized on a team level, rather than the actions of individual players, and given weight by the support of the union. "I know that several teams met as a group and made decisions on what they wanted to do as regarding social justice," she wrote in an email. "The members of the Player's Association executive committee also got together to help facilitate the desires of our membership to find ways to express themselves. Educational sessions were also held as a membership in different cities with community leaders and law enforcement." These days, more teams and leagues are wading into this issue as a group, most recently sparked by the president's condemnation of NFL players who knelt during the anthem -- and owners who wouldn't fire them for doing so. This past Sunday, players on every single team knelt, while others locked arms. 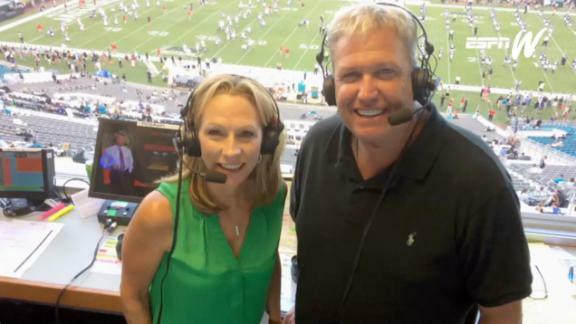 The attention given to demonstrations in the NFL is understandable. The president, after all, didn't specifically call out the WNBA or any other league. And if we're talking about platform, the NFL undeniably has the largest in the nation. Part of this also has to do with the manufactured association of football with patriotism. Dating back to World War II, the sport has reflected militaristic values, from the language used around teamwork and sacrifice, to the development of college football teams on naval training grounds. More recently, the post-9/11 rhetoric on broadcasts, the exploitation of Pat Tillman and the until-recently government-funded military flyovers and demonstrations before games have furthered the idea of football as America's War Game. 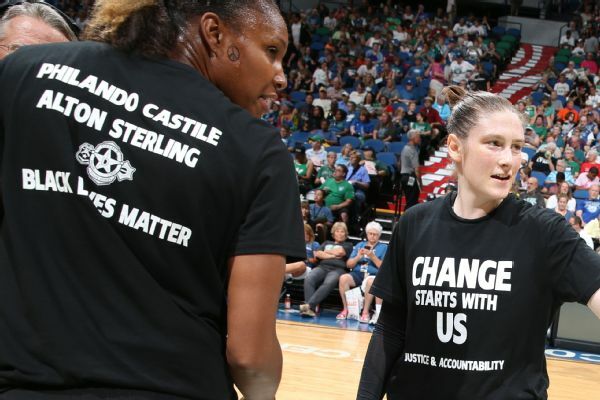 Erin Phillips, left, and Lindsay Whalen were among Lynx players wearing Black Lives Matter shirts before a July 2016 game. But even without these patriotic associations, WNBA players have made vast contributions to the movement against racial inequality, often with higher obstacles. Players from the NFL and WNBA have experienced institutional opposition and fan backlash, but WNBA players are doing so with much lower salaries and marketing potential. NFL players might have more to lose; WNBA players have less of a safety net. Furthermore, the most recent proliferation of NFL protests comes at a time when they've managed to use it to their benefit. Before the president got involved, NFL owners -- and the league itself -- were quick to downplay or even denounce such demonstrations. Now, under a false narrative of "unity," team-approved protest is the hot new thing. 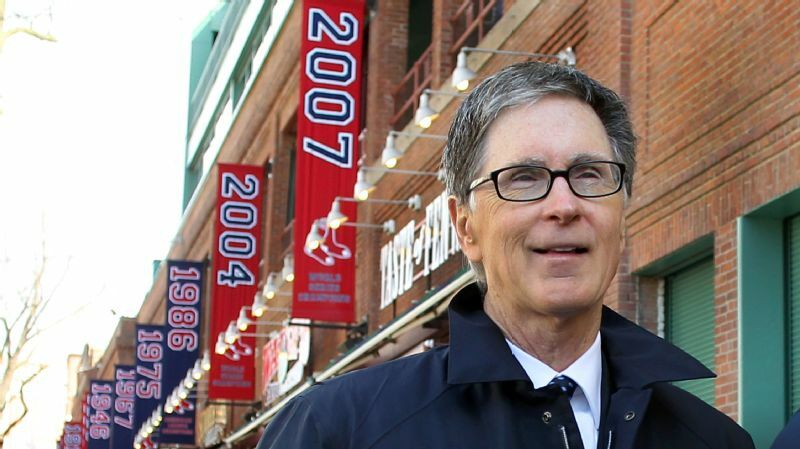 The disparity is particularly glaring on Sports Illustrated's latest cover, unveiled on Tuesday. The cover received significant backlash for prominently featuring NFL commissioner Roger Goodell and Jacksonville Jaguars owner Shad Khan, who contributed money to the president. There's no sign of Kaepernick, while Steph Curry is front and center. Moreover, of the 10 people featured, just one, Candace Parker, is a woman. This comes as no surprise to anyone who's paid attention to the historical disregard of the contributions women -- particularly black women -- have made to major social movements, from civil rights to women's rights to gay rights. Black women were often restricted from participating in the 1963 March on Washington, largely because of the worry that gender would steal focus from race. Despite being at the forefront of the genesis of second-wave feminism, born directly out of their marginalization in civil rights, black women's issues were once again put on the backburner as the popular face of feminism emerged as white and middleclass. This past January, the Women's March on Washington, which was largely organized by women of color, highlighted once again the absence of black women from the movements that owe much of their life to them. For their part, WNBA players aren't paying much attention to how much attention is being paid to them. "Our goal in this was never to bring attention to ourselves," Currie wrote. "We are actually excited that more professional athletes who often have a greater reach than ours are actually taking a stand." She added that while she doesn't think the WNBA's demonstrations were ignored, they certainly weren't given the same coverage as those in the NFL and the NBA. "As women we are often ignored and overlooked but that never deters us. We want to be on the side of what's right and that is what we will continue to do." The WNBA encompasses players who are already marginalized within the sports world for being women, black, gay, or some combination of the three. Yet for more than a year, these players have refused to choose between their race and their gender, protesting for racial justice alongside the Kaepernicks and Currys, fighting for the memories of Freddie Gray and Sandra Bland, showing us that while Black Lives Matter, it's important for us to also remember to Say Her Name. The protests that we've seen by the WNBA have been unique in their collectivism, scope, and organization. So as we continue to watch for the next protests and statements within the NFL, let's not forget the enduring fight by the WNBA, and throw out any notion that these women are only now joining these demonstrations. If anything, the rest of the sports world is finally catching up.